Komen’s South Carolina affiliates have awarded more than $11 million in community grants for local breast health programs! This investment has funded breast cancer detection, treatment support services and breast health education in 45 South Carolina counties. 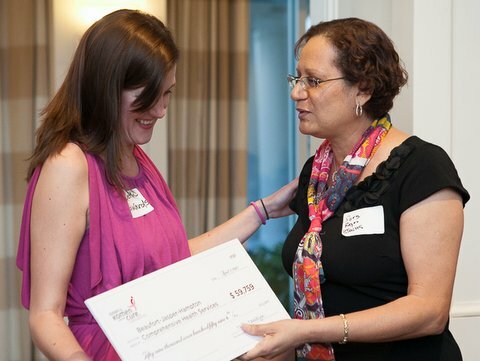 The goal of our Community Grants program is to provide funding for high impact breast cancer programs that work to reduce rates of late stage diagnosis and breast cancer mortality with an emphasis on eliminating breast cancer disparities. Funding priorities are developed based on the findings of the affiliate’s Community Profile reports. FY 19 CG RFA now available! Click here to view. GRANT APPLICANT TRAINING* Click here to register. Sept. 26 Greenville, SC 10 a.m.-2 p.m. 104 S Venture Dr.
Oct. 4 Columbia, SC 10 a.m- 2 p.m. 2711 Middleburg Dr.
*Applicant training is required for all applicants. Beaufort, Jasper, Hampton Comprehensive Health Services, Inc.
For details about these programs or to see if you may qualify for services, click here. Adam Soloff, Ph.D., (Medical University of South Carolina) was awarded $450,000 for pre-clinical testing of a novel vaccine that induces highly specialized cells within the immune system to seek out cancer cells in combination with a new investigational drug, anti-PD-L1, which blocks the ability of cancer cells to hide from the immune system. If successful, this treatment strategy could not only kill existing breast cancer cells, but also produce long-term immune memory that will prevent breast cancer recurrence. Martina McDermott, Ph.D., (University of South Carolina) was awarded $180,000 to determine whether the addition of a newly developed drug that targets a protein called CDK8 to ER and HER2-targeted therapies will increase the response to treatment and prevent the development of drug resistance. Dr. McDermott is inspired by her mother’s battle against breast cancer. Susan Steck, Ph.D., and Angela Murphy, Ph.D., (University of South Carolina) were awarded $405,000 to create the Interdisciplinary Graduate Training Program in Cancer Disparities at the University of South Carolina. Doctoral level students will leverage the institution’s strength in health disparities to conduct research that aims to reduce and eliminate racial and ethnic disparities in breast cancer. For more detailed information about Research Grants, click here.